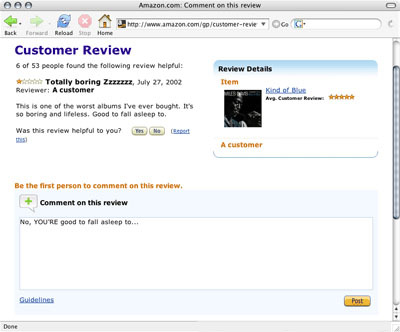 For years, Amazon has tried to keep people from having conversations via reviews with careful instructions about not referencing other reviews. But that didn't stop people from conversing. You often see things like, "Reviewer x is off his rocker..." or "I don't know what some of these reviewers are thinking..." in Amazon reviews. Now people can talk to each other directly. If people know that their reviews are "thread starters" rather than isolated posts, you could get more chatty reviews with open-ended questions designed to provoke discussion. You should also get more flame wars, more trolling, all of the standard online discussion problems. (Especially with an audience as large as Amazon's.) And how do you police comments on millions of reviews? Does each reviewer "own" the thread associated with the review? If so, shouldn't they be able to approve/edit comments on that review? Is it fair to allow comments on a review from six years ago, when the author of that review isn't expecting feedback, and likely isn't tuning into the page anymore? On the positive side, you might get a better view of a product because discussion can bring out more detail. Should be interesting. It's been interesting watching the reviews feature evolve over the years to handle this sort of drama. Anne Rice famously wrote a "review" to respond to negtaive reviews of one of her novels. A while back they asked people to use their real names, and they include a "Real Name" icon next to people who go this route. They also started including a discussion forum for each product not too long ago, but it's so buried on the page that people still use reviews for discussion. This is just hideous. The trolling and flaming will be beyond belief. Thanks for posting this, Paul. This is certainly an interesting development on Amazon.